Featured internationally renowned professional noh artist, Akira Matsui, working in collaboration with seven non-Japanese artists (Lucia Capellaro, Jannette Cheong, Richard Emmert, Piran Legg, Peter Leung, Meili Li, Hugh Quarshie), and two Japanese hayashi instrumentalists (Eitaro Okura and Kayu Omura). 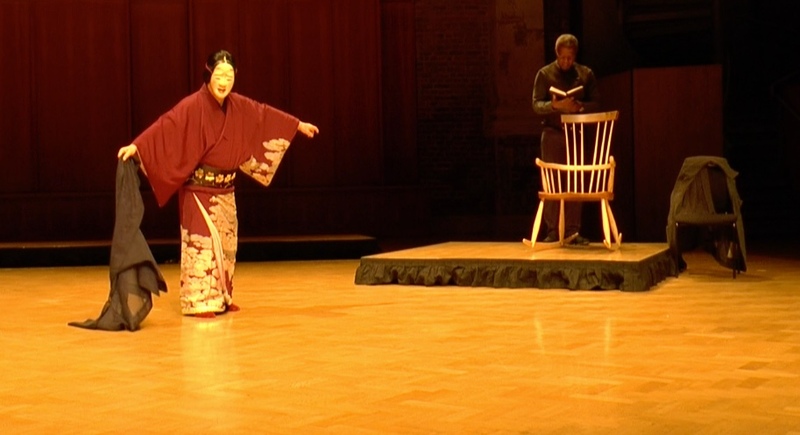 This tribute to Akira Matsui, a Japanese Government designated ‘Important Intangible Cultural Asset’, celebrates his outstanding contribution to Japanese classical noh theatre, not only in Japan, but also throughout the world. The programme was led by Matsui-sensei working with co-producers Richard Emmert, Jannette Cheong and Unanico. We sought to draw out and illustrate the dramatic, vocal, musical, dance, poetic text, and the use of the mask in the art of noh. At the same time Noh time like the present... provided a rare opportunity to experience the 650-year-old art of noh in performance as part of a bold collaboration with western ballet, opera, poetry, music and theatre. Together these classical genres demonstrated their contemporary relevance, flexibility and innovative qualities. The programme comprised three pieces with Akira Matsui in a lead role and a fourth piece with the hayashi instrumentalists only. Each piece highlighted how the ‘essence’ of noh inspires and brings a different kind of energy to western art forms. Considering that this 2017 tribute programme was in his 70th birthday year, as well as the fact that in the same year he was awarded an honorary doctorate at Royal Holloway, University of London, it seemed fitting that a performance featuring him should be held in London. ‘The outcome is an unprecedented layering of tradition and innovation..
Akira Matsui, though not from a traditional noh family in Japan, grew up in Wakayama near the city of Osaka and first appeared on the noh stage as a child actor when he was eight years old. Thereafter, he was given numerous chances to take child roles, which eventually led to his being invited to Tokyo to become a live-in disciple of Kita Minoru, one of the leading actors in the post-war noh world as well as the eventual school head of the Kita School, one of the five main-role stylistic schools of noh. He spent the next ten years studying intensively the dance and music, as well as memorizing the classical texts associated with noh. Akira Matsui often mentions that when he was about to finish high school in Tokyo, while continuing his strict training, he spoke to Minoru-sensei about continuing on to university. Minoru-sensei replied that although he himself had never gone to university, he had never felt out of place when in the company of those who were highly educated in universities, because he too had become highly educated through his classical training in noh. Akira Matsui consequently never attended university but has taught at numerous universities throughout the world. Akira Matsui returned to Wakayama in his early twenties, where he took on many private students and performed. Meanwhile he travelled back and forth to Tokyo, where he also had students and appeared regularly in Kita School performanes. In 1972, he went abroad to Canada and the US with a cultural exchange group from Wakayama, and thereafter he began to be invited back to teach and perform. Several of the tributes included in this booklet tell of his many activities abroad that grew throughout the late 1970s. Artists such as Akira Matsui see the word ‘challenge’ not as an obstacle, but as an exciting possibility. They provide inspiration to others who seek to collaborate and share artistic endeavours internationally. Rockaby was presented by special arrangement with Samuel French Ltd.
Rockaby is a fifteen-minute solo play, written by Samuel Beckett in 1980, premiered in 1981 by Billie Whitelaw, directed by Alan Schneider. In the original play a Woman, seated in a rocking chair, is rocked gently into that dark eternal night by her own Voice. At the end of each of the first three of four sections the Woman echoes the Voice, “Time she stopped.” The rocker comes to a stop, and after a pause, she utters her only word of dialogue, “More.” After the fourth section, the Voice echoes “rock her off” as her head drops to the side, resigned to death. In this rare noh-influenced version, directed and performed by Akira Matsui, the ‘Voice’ was performed by Hugh Quarshie. 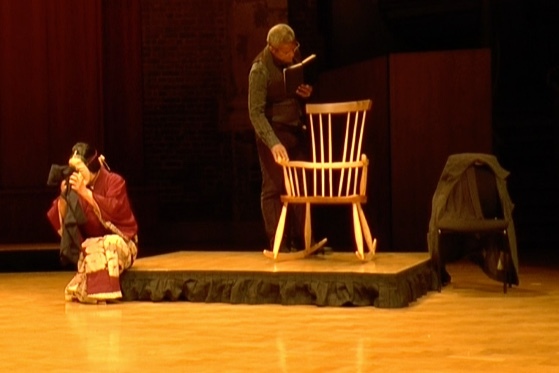 The woman is found in the rocking chair at the beginning of the play and when the Voice begins, the actors appear to have a metaphyscial presence - entirely possible with noh - reflecting the original monodrama, but as a stylized interpretation of Beckett’s play - ‘a moving monodrama fusing poetry, ritual, and drama’. The noh hayashi consists of one flute and three drums, though certain plays in the noh repertory use only two drums, which is the case for our ensemble here. In traditional noh, it is the relationship between instruments and the chant that drives the performance and creates its characteristic intensity. Most notable to Western ears is the use of voice calls (kakegoe) by the drummers. Within a noh play there are musical sections that are purely instrumental. These include music for entrances and exits, as well instrumental dance music. The piece performed here is purely for concert purposes and combines several instrumental pieces from noh. It begins with a solo noh flute piece, called nanori-bue, used for a special type of entrance music. Next, the drums are featured in a free-rhythmic ashirai piece that might be used for either entrances or a short circling dance. Third is the piece kakeri, which is a short action dance featuring two quick tempo changes suggesting the unbalanced state of the dancer. Finally, there is kakko, music for a light, buoyant dance of a performer dancing with a small barrel drum. Akira Matsui has collaborated with classical, jazz and Asian traditional musicians. In each, Matsui maintains a strict adherence to noh traditional techniques while performing with a non-noh performer. Noh Meets Bach is a musical collaboration between the powerful vocal style of noh and Western classical music, here three movements from Bach’s Unaccompanied Cello Suite No.1. The vocal text is in Japanese and comprises short excerpts from three different pieces in the classical noh repertory. The first is from Yamamba (The Mountain Crone)—a story of a dancer from the capital, famous for portraying the mountain crone, meets the real old woman of the hills on a trip through the mountains. The second is from Hibariyama (Mt.Skylark) —a story of a Minister who banishes his daughter to the high mountains due to a slanderous rumour, but is later reconciled with her. The third is from Funabenkei (Benkei on the Boat)—the story of the great general Yoshitsune and his retainer Benkei as they quell the evil spirit of Tomomori that attacks them as they cross the Inland Sea by boat. Akira Matsui’s vocal choices, however, are based more on musical considerations rather than story content. The Yamamba selection is sung in a free-rhythmic dynamic singing style, Hibariyama is in a matched-rhythmic poetic segment sung in the melodic style, and Funabenkei is sung in a matched-rhythmic dynamic style. Opposites-InVerse uses elements from classical noh theatre, including poetic structures, vocal and instrumental music, and the movement of a noh masked performer. The vocal elements, however, are sung in an operatic style and the movement is a combination of contemporary ballet and the intense grounded quality of noh. As collaboration, the intent is for all performers to stay true to their own practice, yet cross boundaries to create a new work combining their different disciplines and styles. Opposites in balance (differences that find a balance, presented here as an acceptance of one another and themselves). These cycles of change may seem more apparent in the natural world, but humanity also repeats such cycles time and again, and the work aims to provide food for thought about such patterns of change. Read more about the ideas that influenced the development of Opposites-InVerse. Special printed edition copies of this tribute programme can be obtained through 'Contact us'.